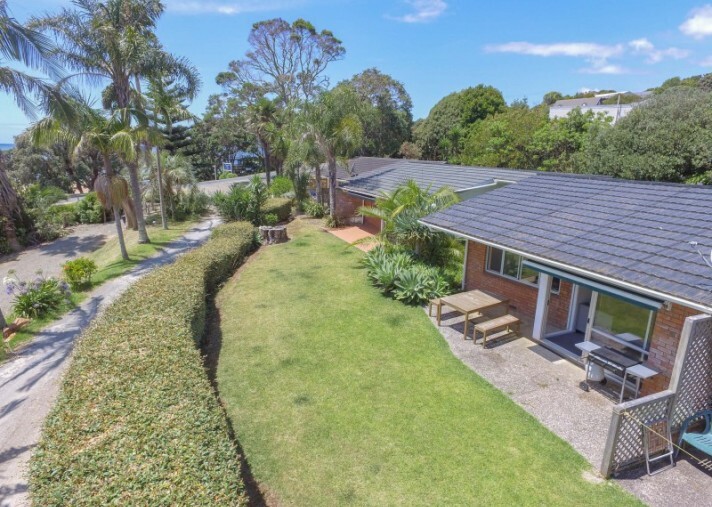 Right across the road from Cable Bay beach and set back amongst well-kept lawns and gardens is this easy care 2 bedroom unit style home with outdoor living and lovely sea and garden views. The unit is of brick construction in sturdy 1960s style and the property includes a fee simple cross lease title - 1/5 share - in 1411 sqm of prime beachside land. Entry into the home is via a rear parking area, through a tidy compact kitchen and on to an open plan lounge and dining room that takes in superb sea and garden views. A sliding door off the lounge leads out to a semi covered patio (with extendable awning) and a good sized seaward facing lawn. The master bedroom has large windows that look out on the garden, beach and bay. The second bedroom is a good size double. Adjacent to both is a bathroom with shower and separate toilet. The bathroom and kitchen are tiled and all other areas are fitted with hard wearing carpet. An added bonus is a new roof is about to be installed February 2019. This property is ideally suited as a lock up and leave getaway, holiday rental, or no fuss permanent beachside home. 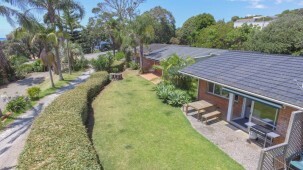 Local shopping centres and a range of other facilities and attractions are close at hand and the property is connected to mains water and wastewater services. Contact Michael Healy for further information or to arrange an appointment to view.